Manifestations in Beirut as well as Amman/Jordan where 25.000 rose in protest. Egypt now opens its border to Gaza for the rescue of wounded Palestinians. The Muslim majority of Indonesia's 220 million inhabitants opposes Israel's Gaza attack, says Professor Bahtiar Effendy from Islamic State University, Jakarta. Meanwhile, the figure of Palestinians killed has risen to more than 500. Many Palestinian families lost their homes while Israel's army joint their airforce and navy in the merciless bombardment when it passed the border to separate Gaza City from the rest of the Gaza strip. Voices from all over the world, including the UN Security Council, are demanding Israel to stop the bloodshed. January 10 (day 15 of war) - 830 Palestinians killed - 3350 wounded. January 11 (day 16 of war) - 888 Palestinians killed - 4080 wounded. Israel is accused of using white phosphorus in its bombs. Burning phosphorus is known to inflict serious wounds when coming in contact with the human body. A similar devastating effect could be achieved by napalm which the U.S. applied in Vietnam against, both, guerillas and civilists. Indonesia: 50.000 protest against the war on Gaza. While U.S. president-elect Barack Obama's presidency is approaching, Israel's president Olmert declares "Israeli military close to fulfilling their goals in Gaza". As Israel is able to apply nuclear weapons, voices are getting louder that it might plan to use those weapons against Iran, best equipped enemy to the Jewish state. U.S. authorities lately denied a report saying they received a request from Jerusalem for additional weapons. January 15 (day 20 of war) - 1078 Palestinians killed - more than 5.000 wounded. Israel accused of shelling UN headquarters in Gaza City while UN general secretary Ban Ki-Moon is holding talks with the Israeli government. Israeli shell hits marked UN vehicle in Gaza. Gaza's media building hit by Israeli shelling. Red Crescent hospital in Gaza City hit by Israel. Qatar calls for emergency summit on Gaza truce. Israel questions legality of UN emergency meeting. Venezuela and Bolivia break diplomatic ties with Israel. Iran is discussing war on Israel. Oussama Bin Laden (January 14, 2009) is calling for a Holy War on Israel. NHK World TV, Tokyo, (January 14) is discussing the development that led to the current situation: After Hamas won the Palestinian general elections in 2006, differences with its moderate counterpart Fatah increased, thus, resulting in clashes between both groups in 2007. Since then, Gaza has been controlled by Hamas while the former Westbank territory is being ruled by Fatah. Rockets have been launched on Israel from the Gaza strip, steadily but on a low scale, until Israel decided a "bombing out" of Hamas activists from Gaza. A few rockets have even been launched from Lebanon by a small number of Hamas supporters while Lebanese Hizbollah activists were not involved at all. While Israeli troops are being withdrawn from Gaza, only hours before U.S. president Obama's inauguration, here's the provisional statistics of human casualties among the Palestinian population and of material damage made to their infrastructure. The death toll of Palestinians cannot be finally determined at this moment as the rubbles of Palestinian homes are just going to be fully removed. The total assessment of human and material damage could therefore last some further days. By the way, about 100.000 Palestinians have been displaced by the war. When it comes to the evaluation of Israeli losses in the 22 days lasting war: 13 Israelis are reported to be killed, including three civilians. The following images show the urban areas of Gaza that have been shelled by Israeli troops during the last days. Local witnesses in the Rafah area (Gaza's southern border to Egypt) told Al-Jazeera that most damage to houses, plantations and water irrigation devices has been done by Israeli troops while they withdrew from Gaza territory after fighting had ended. A desperate father reported to Al-Jazeera that his family was ordered by megaphone to leave their home. When they did so, while carrying a white flag, his children were shot from a distance of about ten metres by an Israeli soldier who let their father alive. Images from destroyed homes show Israeli graffiti reading like: "We are the good guys. Yours are the bad ones." Comment: The Beginning of the End ? An Israeli airstrike in Sudan is reported by Al-Jazeera. The airstrike targeted a convoy that allegedly transported arms from its Sudanese shipping port, Port Sudan, to the Egyptian frontier with Gaza. While U.S. Africa Command denied any participation in that military action, Israeli government sources launched a statement that confirmed, Israel would hit their enemies whereever it might be necessary. Up to now, the Sudanese government denied any knowledge of that incident on its territory. At the same time the use of phosphorous in Israeli grenades during the latest Gaza incursion has become a subject of the public debate on Israeli war crimes in Gaza. Earlier reports by Al-Jazeera already showed evidence that Palestinian civilians and their property had been targeted willfully by Israeli forces during the Gaza offensive (look above). Annotation: The following post on U.S. President Bush is as hot as this one ! On the occasion of the eighth anniversary of cooperation between Cuba and Venezuela, different treaties on the implementation of further common projects are signed by members of both governments. The Cuban president Raul Castro receives a distinguished decoration from Hugo Chavez, president of Venezuela. Furthermore Raul is given a rapier reminding Simon Bolivar, the liberator of South America from Spanish colonialism. Raul Castro in exchange gives away a photo, dating back from 1958 and kept by Raul as a reminder of the battles later to be fought in the frame of the Cuban revolution. It is showing Raul wearing the uniform of the Cuban guerilleros and in front of a monument dedicated to Simon Bolivar and that had already been decorated with the emblems of, both, Cuba and Venezuela. In their individual speeches, the leaders of both countries are referring to General Simon Bolivar and General Sucre who were at the origin of Latin American nationalism. Further crude oil from Venezuela will be provided for a new refinery that has recently been established with the help of Venezuela. The actual volume of economic cooperation between both countries is comprising 3,6 billion $. at the president, simultaneously naming him a "dog". quite like national "progenitor" Abraham. seemingly trying to sing the DOW index further down. Five long-term detainees at Guantanamo Bay, among them Khalid Sheikh Muhammad, have pleaded guilty before the September 11 tribunal. 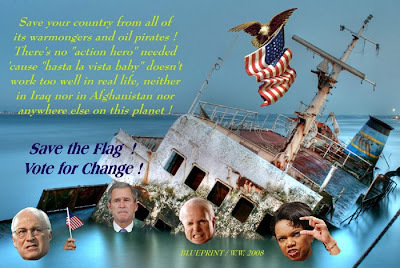 None of them is showing any regrets at what had happened in 2001. They insist on being sentenced as soon as possible in order to die as martyrs. Pakistan - Militant islamists torched armoured NATO vehicles. Pakistan - Arrest by Pakistani forces of 15 alleged Mumbai terrorists. Afghanistan - The Taliban claim control of 72% of Afghanistan while a study of the International Council on Security and Development (ICOS) confirms an increasing presence of the Taliban in most regions of the country, including Kabul where new military checkpoints have been recently installed. November 18: Chinese leaders sign a trade deal with Cuba. 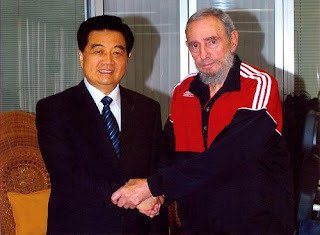 1) The sentimental value of Hu Jintao and Fidel Castro deliberating on the good old days of a Cuban-Chinese friendship that is dating back to Mao Tsedong and Deng Xiaoping, and that is coming together with badly needed humanitarian aid. A sentimental value that pays in terms of an increasing prestige for China. 2) The economic value of a trade deal that enables China to exploit Cuban sugarcane and nickel, both commodities belonging to the few material values Cuba has to offer. An economic value that has to be seen before the background of an outdated U.S. embargo and at a time of "interregnum" when a new and more liberal U.S. president elect is forced to wait for his official inauguration and for the very first opportunity to do his job. 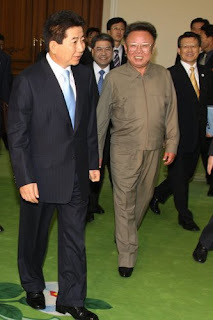 Nevertheless, this is a win-win situation for both, Cuba and China. One partner is gaining political and economic influence, while the other is being helped to survive the hardships of recent natural disasters and a (steadily crumbling) political discrimination. Its the U.S. that is losing this match ! 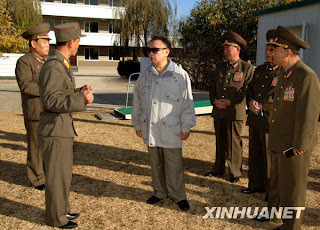 Kim Jong Il visiting a unit of female artillery soldiers on October 11, 2008. 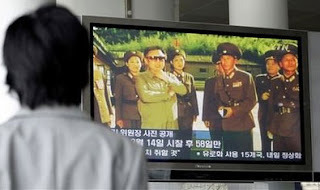 Could it be that the North Korean leader has received a severe burn ? 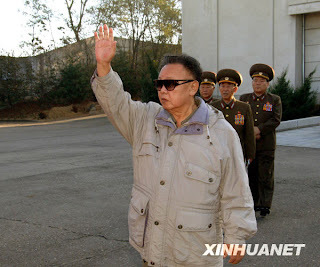 Since October 3, 2007, when the South Korean president met with his counterpart, we didn't receive any reliable image of Kim Jong Il at all. 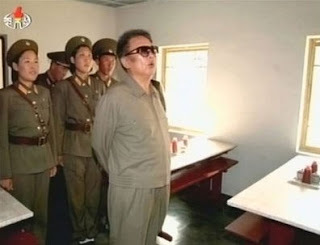 We can therefore suppose that "Zombie" Kim Jong Il is still alive and might have recovered from a kind of "disease" that goes without any further comment. 1. 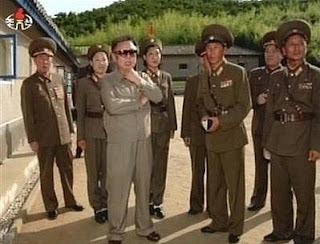 The days of the North Korean leadership are obviously counted, and whatever might happen to that country, it will happen very soon. 2. As it is difficult to imagine any essential change coming from the inside, Chinese and South Korean support will be needed to ensure the country's transformation into a modern state, fully accepted by the international community. When in 1938 most German synagogues were torched and jews were chasen from their houses, separated from their families, their property being robbed or destroyed, this was nothing else but a first test for the organized liquidation of the jewish race under Nazi rule. Looking back to those days, it should be mentioned that ordinary German citizens did not really react upon the proceedings of that night. Daily life continued as if nothing had happened. New jobs were created for the common people as jews disappeared, and some seemed to get rich overnight. In the days of my youth, we often heard from the elder generation that "only few" actually knew about the cruelties that happened to the jews. Of course, there were only a few people who got an insight of the concentration camps and were able to tell about it afterwards. Nevertheless, many others must have remarked the new laws that discriminated the jews, laws that had already been created in the years before. They must have seen burning synagogues and prayer rooms and must have heard the shoutings of hatred in their neighbourhood in the night of the progrome. They must have seen lots of people being driven through the streets of Berlin or Munich to the great railway stations from where they were sent to the concentration camps. It wasn't fear alone that held ordinary citizens back from protest but rather mere indifference towards the cruelties they didn't like to see, an indifference most Germans had to pay for during the following years of war. Therefore, I dare predict that any discrimination within a modern society could lead to the same results again. As people are forgetful when it comes to learn from history, and because it is easy to stir up the animosity of ordinary people against any social group that has been elected as the "jew of the year", even the consequences of a social crisis could easily lead to that devastating mechanism. 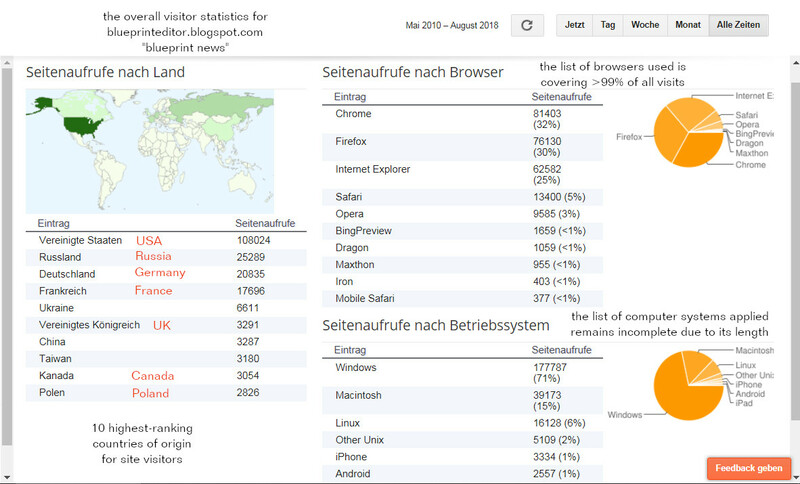 Unfortunately, there is a global economic crisis comprising Germany as well. Let's therefore remember a social law, called Hartz IV and that is depriving the long-term unemployed from exercising some of their constitutional rights, such making them potential victims of blackmail attempts by potential employers or by their spiteful middle-class neighbours who are trying to disguise a right-wing attitude yet being sensitive about their own reputation. That law alone, feared by the unemployed as well as by those who might loose their jobs, could be a nice pretext to trigger off a nasty hunt for the scapegoat, the so-called "lazy unemployed", while the real problem is situated somewhere else in the structure of society. Of course, the victimization and annihilation of a social or ethnic group is not a German invention at all, but nowhere else had it been organized better on behalf of its national leadership. Additional laws, created to enforce a tighter grip on each citizen and based on the false pretext of a "fight against terrorism", are already available or being prepared. And we have become used to similar laws on other fields of daily life. Who then would find anything unusual in the private hunt of some self-righteous middle-class type for "terrorists" or other "suspicious elements" in his neighbourhood, in that time where snoopers and informers are easily to be found. A steadily decreasing level of education, already effecting German economy, and the undemocratic attitude of blockheaded remnants from the former East-German state party or state security (*) will then enhance a climate where everything might become possible. 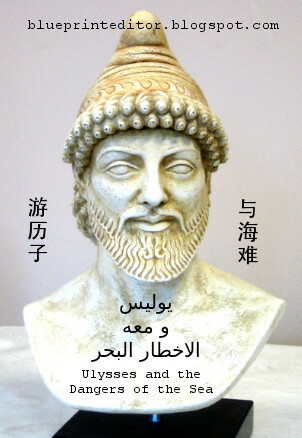 As already indicated above, the middle-class of our society seems to be the decisive source of fascistic thinking, - that part of society, deeming itself superior to the working class and simultaneously knowing that its access to influence and public power is only restricted, due to its medium level of education. Scared by any economic or political change, this group of citizens is tending to counteract such changes and resort to extreme positions. As the left-wing orientated politicians are traditionally related to the despised working class, they prefer to rely on right-wing orientated groups and their leaders. Such, it is easy to understand that about 60% of the fascistic National Democratic Party's voters belong to that middle class. The first concentration camp, established by Nazi leader Himmler, a typical middle-class type without any special abilities and who had been estimated by his father as a "useless weakling in a bad company". Throughout the years of Nazi rule, Himmler's father, a well-reputed highschool teacher, refused to speak in favour of his son (source: documentation on Himmler's father on a German national TV channel, some years ago). The activitiy of former East-German security types after the reunification is a specific German aspect when it comes to evaluate fascistic resources in the Federal Republic of Germany. Once the most important extension of a fascistic state and its true base of power, some former state security men and women, together with their uniformed counterparts of the former People's Police, have found ways to resume their used activity under the roof of powerful Western companies like Siemens, Telecom and parts of the armaments branch. Companies that suddenly longed for "professional advice" on works security, at the same time when thousands of employees were going to be dismissed because of a degrading economy. Thus, it became a question of survival again to guard one's words and to watch out who was listening. This new wave of "security enhancement" finally led to cases like that of Munich Airport where former state security men already were on the brink of taking over control. Now, the authorities became alarmed, and it was the former Bavarian prime minister Stoiber who ordered to replace all of the security companies involved. The German media had the facts. I. The vote ratio in favor of Obama is now 174:49 after the Democrate's candidate winning over Pennsylvania and Ohio. II. Democrates have just reached a majority in the Senate. Obama elected president of the United States. Vote ratio 297:139 (270 needed to become president). => Click to the images for a better resolution ! The above image has been composed by Ulysses / Wolfgang Wiesner, the editor of BLUEPRINT magazine. 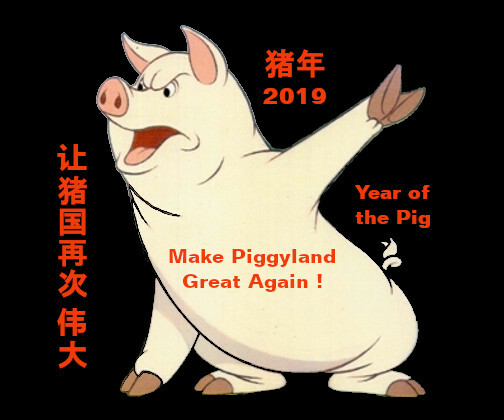 It is intended to express the personal opinion of its author and may be distributed in the frame of the actual presidential election campaign. Click to this image for a higher resolution ! Only six days before the presidential election, Senator Obama is still leading the race to the White House. If a beginning stabilization of the financial markets is making further progress, the urgent need for economic measures might not overshadow the public evaluation of both candidates any longer, such giving way to a less emotional debate. This could benefit Obama rather than McCain. 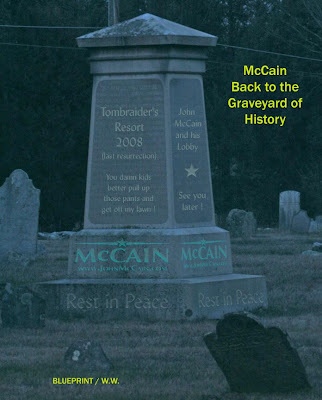 As the Republican candidate McCain is expected to pursue the failed politics of the actual president Bush while his running mate Sarah Palin doesn't seem to be the best possible choice, his chances to win are not really going to increase. Nevertheless, Barak Obama, the magician of change, should be warned as there's a saying from Confucius: "Someone who is decided to make great changes happen, he should speak low and carry a big stick with him." Today: Cuban Foreign Minister (usually referred to as "canciller" or chancellor) Felipe Perez Roque addressed the United Nations' General Assembly. In his speech, Roque attacked the economic blockade that has been imposed and maintained for tenths of years by the United States. He described the results of such behaviour in a time of climate changes that caused devastating hurricanes and made Cuba's people suffer without sufficient help to be provided from the outside. Therefore, Roque compared U.S. politics towards Cuba with a genocide. He added that a rising number of states became in favour of Cuba's claim to be freed from an unjustified U.S. embargo, states that are, like Cuba itself, now subject to U.S. pressure. For more information refer to Periódico 26 / Cuba. According to RADIO HAVANA, the votes against the Cuban initiative are from the U.S., Israel and the Pacific island state of Palau. The original speech of F.P. Roque has been recorded by BLUEPRINT magazine.